Stamp white panels as desired. 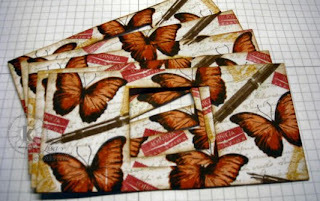 I used the Faux Collage Technique and stamped with the following images – 3 Step Butterflies in #1 Dusty Durango stamped off, #2 Dusty Durango, #3 Black Archival. The other images are from 3 Step Letters from the Past; Script stamped in Sahara Sand, Air Mail in Rose Red, and Postage in More Mustard, Pen #3 Chocolate Chip, and #2 Close to Cocoa. The edges are lightly sponged with a sponge dauber and Chocolate Chip Ink. Using an Old Olive Marker and the Spritzer Tool, I added some splatters to fill in any white space. Assemble your Dusty Durango panels – attach the 1st panel to the second by over lapping, continue adhering all panels in this manner. Place one of the stamped panels on the 2nd square as shown. You’ll be attaching the left and right sides to the Dusty Durango Panel as shown. 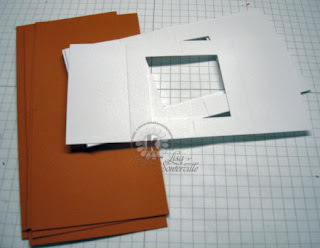 Flip your panel piece over – this time you are working on the first Dusty Durango Panel. 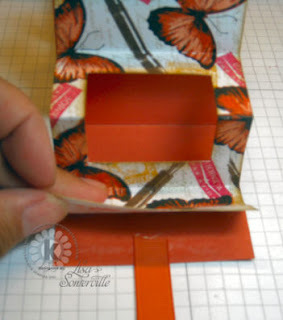 Before you adhere your panel, place one end of one piece of ribbon in the center. Adhere white panels as in previous step. You’ll adhere all four, be sure when you get to the last one, you insert your ribbon as you did here. Finish front as desired. 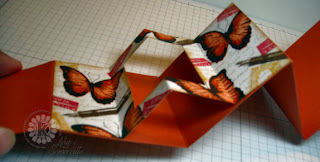 The panel with the stamped butterfly is popped on dimensionals so that I can thread the ribbon to tie my Concertina Book closed. Kitchen Sink Stamps is going on a Road Trip - click here to read more! Hope to see you there! Lisa, just beautiful! Your color selection is marvy, thanks for the directions..luv it! What a wonderful mix of images on this gorgeous Concertina Book! Awesome masking! 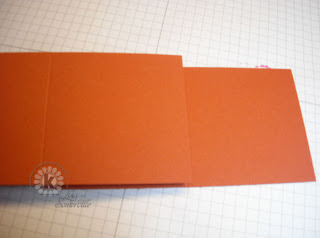 Thanks so much for the step by step directions to build this fabulous project!! It looks amazing!!! This is really fabulous. Those stamps are so beautiful and the project is so fun. I am sure to case this thanks for the tutorial. Wow, Lisa!! This project is just stunning!! Love everything about it..the images, the colors...stunning! I love how you designed your own paper for this project. THanks for the tutorial. I'll have to give this a try sometime. This is fabulous, Lisa!! I definitely make one for me. Thank you for the great tutorial, too!! 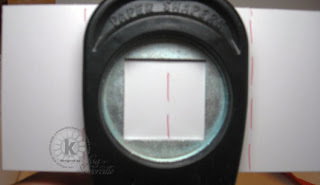 This is what I love about stamping! You showcase making your own pattern paper perfectly (say that 3 times fast!). I too would love to see what you wind up putting in here. Awesome! I love those beautiful butterflies. This is a fabulous project, thanks for sharing. Such a great POM! I love that you created your own DP and the images you chose look fabulous! I never would have put them together. Wonderful! 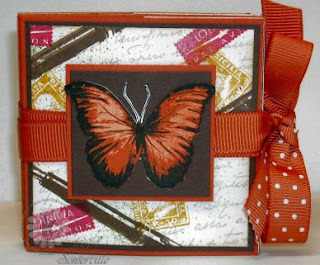 Lisa, this is a beautiful creation done with some of the prettiest stamping I've ever seen! I LOVE the collage technique you used! TFS the tutorial! Wow! This is fabulous, Lisa! Thanks for sharing the detailed tutorial.